Former Soviet republics are anxious about further escalations in Afghanistan after the NATO 2014 withdrawal. Such fears were made public at recent meetings of their foreign and defense ministers in Bishkek on May 27. The Collective Security Treaty Organization (CSTO), a Moscow-led military and political alliance of former Soviet Union states, does not rule out escalations in Afghanistan. The situation there topped the agenda for the informal meetings of CSTO foreign ministers, defense ministers and security council secretaries in Bishkek on May 27. 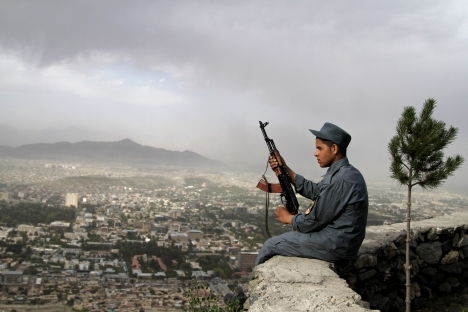 Their outlook for the situation in Afghanistan after 2014 is a negative one. The bloc consists of Russia, Belarus, Kazakhstan, Armenia, Kyrgyzstan and Tajikistan. CSTO experts have worked out a variety of scenarios for Afghanistan once NATO and the United States withdraw their contingents, the diplomat toldKommersant. Yet CSTO Secretary General Nikolai Bordyuzha admitted last week that the most realistic outlook is a negative one. Zamir Kabulov, Russian presidential envoy to Afghanistan and head of the Russian Foreign Ministry’s second department on Asia, shares this vision. “Unless the Afghan National Security Forces [ANSF] manage to boost their fighting efficiency — and we are less than optimistic about this — the extremists’ influence will probably grow, which may have various negative consequences, including a civil war and ethnic-based dissent,” he stated previously. The current situation in Afghanistan explains why specialists are pessimistic. The CSTO ministers and secretaries of security councils addressed the main challenges to which the neighbors of Afghanistan (Tajikistan alone has a 808-mile border with Afghanistan) already have to respond: incessant drug trafficking, danger of invasion by armed gangs trained in Afghan camps, dissemination of radical religious ideas and support for local fundamentalists in Central Asia, and arms smuggling. These problems may get even worse after 2014. The meeting in Bishkek also addressed methods for improving combined operational and combat training for the CSTO joint rapid-deployment forces. First published in Russian in Komemrsant Daily. Russian Defense Minister Sergei Shoigu has called for increasing the capacity of the Russian air base in Kant, Kyrgyzstan (a member of the CSTO) and completing construction of unfinished facilities, Deputy Defense Minister Anatoly Antonov said on May 27. The decision was made right after the United States announced plans to shut down its air base in Manas, not far from Kant. Experts agree that the upgraded Kant air base would increase the potential of the CSTO joint rapid-deployment forces; even so, they argue that the Taliban threat is overstated in Kyrgyzstan. The Kant air base was unveiled in 2003, as an aviation component of the CSTO joint rapid-deployment forces. In 2009, Russia and Kyrgyzstan signed a 45-year lease, under which Moscow pays Bishkek more than $4.5 million every year. Russia leases military facilities in other CIS countries as well, the largest assets being the Black Sea Fleet in Ukraine, the Gyumri base in Armenia and the 201st base in Tajikistan. Vzglyad notes that Moscow has been endeavoring to expand its military presence in the former Soviet Union since Shoigu was appointed defense minister in November 2012.